The Costiera Amalfitana is a landscape with exceptional cultural and natural scenic values. 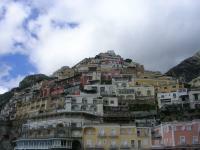 The steep slopes of the Monti Lattari, rising from the coast, are dotted with colourful little towns. Between 839 and around 1200 this area formed an independent republic, with its own money and laws. 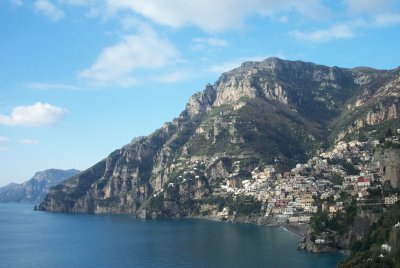 The Maritime Republic of Amalfi was an important trading power in the Mediterranean during those days. 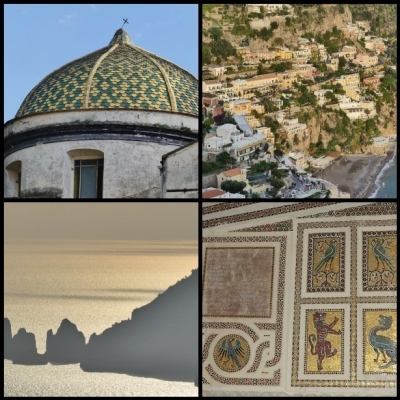 Amalfi - Atrani - Cetara - Conca dei Marini - Corbara - Furore - Maiori - Minori - Montalbino - Praiano - Positano - Ravello - Scala - Sant'Egidio - Tramonti - Vietri sul Mare. A visit to the Amalfi Coast is a refreshment course on driving curves. 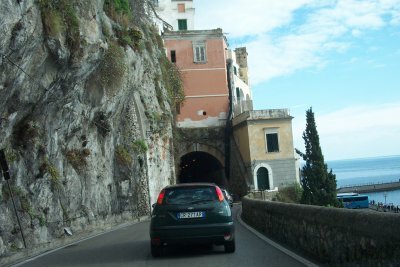 In my rented Nissan Micra I followed the road from Salerno to Positano. Some of the views of the coast and the small towns are awesome, but when you're the driver you've got other things on your mind. There's another majolica church tower - but be careful, there's also another bus coming around the corner. Highlight of my day was Ravello. This town lays a few kilometers inland. Loud traditional music sounded from the Dome square when I arrived, it could be heard all over town. 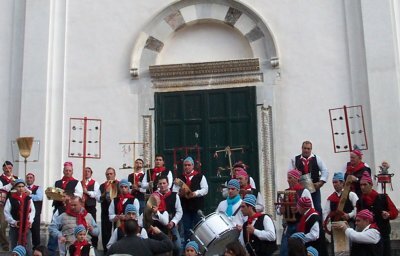 A band was playing (in celebration of New Years Day, I suppose) with children singing. The people at the square sang along at the catchy tunes. I felt so happy just standing there and being able to enjoy this moment. After a while, the driving and the lack of places to stop got the best of me. The roads also got more and more busy. To enjoy this coast more fully, it's probably best to stay in one of the towns so you can sightsee on foot. I decided to end my trip to Amalfi with a fine lunch in Majori: caprese, with fresh mozzarella. I visited this WHS in November 2018 basing myself in Ravello for 3 nights. Even though I enjoy roads with lots of hairpins and heart-stopping curves, I would avoid driving during the peak summer months. Parking, traffic and driving in general can be a nightmare even during Autumn-Winter so I can't imagine what it's like in the summer months. Even though there are several hiking treks and panoramic viewpoints over the Mediterranean, I very much prefered the ones to be had at the Cinque Terre in Liguria. Overall, from land I found it quite similar to the Cote d'Azur in France. I promised myself to revisit and explore the Costiera Amalfitana by boat which I think could be a better alternative to enjoy this WHS. My personal favourite viewpoints were from the narrow roads and few parking spaces just before (top right photo) and after Positano and from the expensive Villa Rufolo in Ravello. My favourite cathedral exterior was the one in Amalfi while my favourite interior (mostly because it surprised me) was the one in Ravello with its mosaic and marble pulpit by Bartolomeo (bottom right photo). Another worthwhile viewpoint is from the roof terrace of the Chiostro di San Francesco in Sorrento at sunset from where there are excellent views of the Costiera Sorrentina, the Stacks or Fariglioni of Capri (bottom left photo) and the Vesuvius in the background on one side, and the Costiera Amalfitana on the other. From Ravello, I must say that my favourite stretch of the Costiera Amalfitana was the one from Positano to Praiano, even if quite touristy and crowded, while I absolutely loved the restaurants and welcoming locals around Vietri sul Mare and Maiori. The fresh fish and lemon sciatielli pasta were divine and more fairly priced than the other tourist traps along the Amalfi Coast. When I was young I often saw pictures of the Amalfi Coast on calendars, but to see it in person was incredible. This is a stunning landscape with cliffside villages perched above the sea; I can easily understand why it was recognized as a World Heritage Site. I visited the coast as part of a day tour from Naples in 2013, and I was very happy to have been on a bus tour. As much as I enjoy driving along coastal roads, I'm not sure I would have liked navigating all the curves and narrow town streets with the volume of tour buses on the same route. Our tour offered some walking time around Amalfi, which was a sun-soaked town with a beautiful cathedral dedicated to Saint Andrew. In Amalfi and all along the coastal route we passed citrus vendors selling fresh lemons grown on the mountain terraces; these lemons are used in the making of limoncello, a local liqueur. If I'd had more time, I would love to have visited or spent the night in other towns we passed, such as Positano or Ravello. Logistics: You can reach the coast by car or bus, but the coast may be more enjoyable if you don't have to drive. There are also boat tours along the coast. The scenery around this coast is simply stunning, so to enjou it I took the bus from Salerno to Sorrento, stopping off at Cetara, Amalfi and Positano en route. The most rewarding visit was the side trip by bus from Amalfi up to Ravello. I too found this a delightful village with spectacular views. There are two things to remember about the Amalfi Coast: the first is its beauty and the second is the harrowing journey it takes to get there. 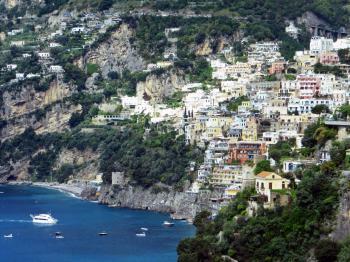 Based in Sorrento, I and my girlfriend visited Positano by bus, following the coastal road with its sharp turns and perilous contours. Surviving the ride, we were greeted, in the middle of April, to a hailstorm, which significantly hindered our walk through the town. Nevertheless, we eventually reached the beach, after many cafe pit stops along the way, where we ate lunch and admired the scenery of this incredibly picturesque coastline. Time constraints forced us to cut our visit short, but even the little time spent in Positano was sufficient to grasp the splendour of the landscape and to inspire a return visit in the future. The Amalfi Coast is one of Italy's most beautiful landscapes. The views of the coastline and the sea are fantastic from everywhere, and the little towns and villages have considerable charm and atmosphere. 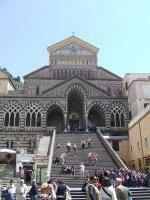 The town of Amalfi itself is very interesting as well, especially the cathedral. Some towns like Positano cater more to the rich and famous, but everybody will find a place to his liking. I agree that driving on this road is not very easy to do and requires lots of nerve and skill, but there are always public buses as well. All in all, a must-see if you are in the Naples area. 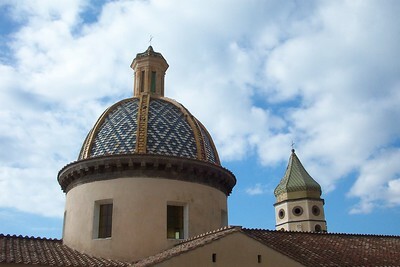 Gold Surfaces: Facade of Amalfi Cathedral is illuminated by gilded and enameled mosaics. Designed by Oscar Niemeyer: Niemeyer Auditorium (Ravello) inaugurated in 2010. Destroyed during invasion: Scala was destroyed by the Pisans in the 12th Century. Built or owned by British: Villa Cimbrone in Ravello was owned and modified by Lord Grimthorpe. 242 Community Members have visited.